In our final video we demonstrate the entire CoCoRo system communicating and interacting together, including: the base station, a “relay-chain” swarm, and a search swarm on the ground. The video was our demonstration to our reviewers. I’m pleased to report the CoCoRo project received an ‘Excellent’ in their assessment! The Year of CoCoRo has now concluded; we hope you had fun watching the project videos throughout the year. CoCoRo will live on in the follow-up project: subCULTron. You can learn more about subCULTron on our website, twitter, or Facebook. 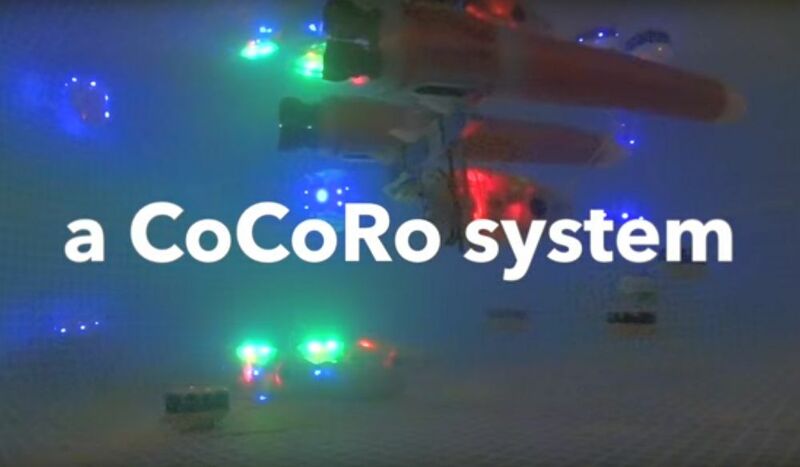 The EU-funded Collective Cognitive Robotics (CoCoRo) project has built a swarm of 41 autonomous underwater vehicles (AVs) that show collective cognition. Throughout 2015 – The Year of CoCoRo – uploaded new weekly videos detailing the latest stage in its development.